This is one in a continuing series of posts over the next few weeks; all the things I’m selling are “prizes” or “souvenirs” or “participant” gifts given to the competitors at various dance events which I’ve attended. I am willing to negotiate; make me a serious offer. Two sturdy woven strap handles long enough that you can put them over one shoulder. When zipped the bag tapers to the width of the zipper at the top. When unzipped the bag is very flexible and can accommodate a lot of “dance gear” that you need when you go to comps or dance workshops. Sturdy vinyl – smooth on the inside, feels like canvas on the outside. Never used – New condition. I like the bag, but I have sooooooo many bags, I never got around to using this one. “UCWDC Special Series” wraps up with a “Review” of 3 Dances! Tue August 30th is “Review” Night! 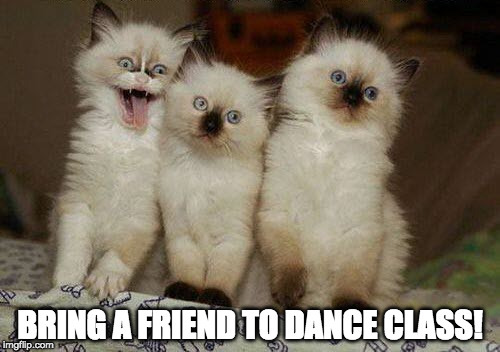 Sooooo….we’ll review the three UCWDC Competition Line Dances we’ve learned. Woo Hoo!!! For those students who are new this month to the class, a “review” night is where we briefly go over each dance. Music: Happy Girl / by Martina McBride (pitched down to 108) — This dance can be danced to just about any slow cha-cha song. If you need information on how to pitch a song down, ask me in class. These three dances are the UCWDC Newcomer Level competition dances for 2016-2017. The Dallas Dance Festival, in November; and Big D Bash, held in February. Big D Bash is an all line dance event – 3 days of nothing but line dancing. The line dances incorporate basic footwork from those two styles thus these dances are an EXCELLENT PRACTICE DRILL for Couples Dancers who wish to have a way to practice fundamentals on their own. See ya on the dance floor!!! !